The Esmeralda Inn is a beautiful 14 room Lake Lure bed and breakfast inn with all the charm and personality of the surrounding Hickory Nut Gorge. The Esmeralda Inn has been transformed over the years, providing our guests rustic accommodations with a warm, contemporary ambiance. Known as one of the best hotels in Chimney Rock, NC, all the rooms in our inn are guaranteed to be exceptionally comfortable and accommodating. Each of our rooms offers sumptuous linens and bathrobes; first quality, environmentally friendly spa toiletries, extraordinarily comfortable beds, 32″ high definition flat panel televisions, Bose Wave music systems, wireless internet access, private baths, and more. Other amenities include coffee and a full breakfast each morning to start your day off right! As a Lake Lure bed and breakfast, we are committed to providing our guests with a homey atmosphere and experience. In addition to our many rooms, the Inn also makes available a large leisure area where guests can relax and enjoy multiple seating areas, quiet reading space, television and game room featuring billiard table, foosball, air hockey and board games. Sip coffee on the front porch or second-story balcony, and start your day with morning mountain views. The Esmeralda Inn offers several room types that can accommodate a wide range of party sizes and guest desires. Choose from rooms with beautiful mountain views and take advantage of our public terrace or choose one of our Terrace King rooms which offer semi-private terraces right off of the room. We guarantee a comfortable and relaxing stay, no matter what room you choose. 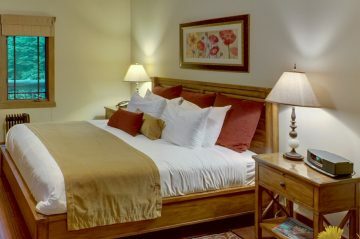 Check out our 14 rooms below and find out why The Esmeralda Inn is one of the most relaxing places to stay in Lake Lure! Our Traditional Rooms offer luxury linens, environmentally friendly spa toiletries; extraordinarily comfortable beds and private baths. 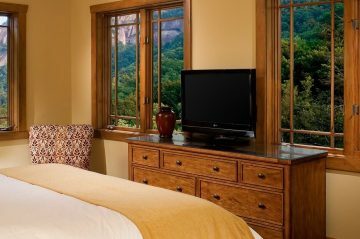 Our Mountain View Queen Rooms feature stunning views of Chimney Rock, the Rocky Broad River, and the surrounding Hickory Nut Gorge. 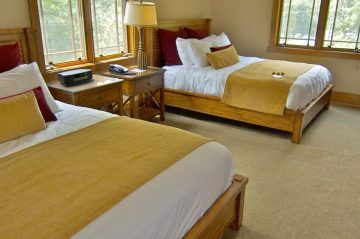 Our Premium Mountain View Rooms are slightly larger rooms offering larger, more open floor plans and breathtaking views. Our Terrace King Rooms are our largest, most luxurious rooms with direct access to our second floor public terrace.